Yeah, that’s right! 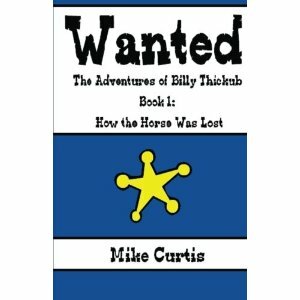 It took a long, long time, but Mr. Curtis’ book Wanted: The Adventures of Billy Thickub is finally out and available. It’s the story of a young man growing up in the Old West. His best friend is his horse, Old Steve – which Mr. Curtis freely admits is a ridiculous name for a horse. Anyways, this young fella – his name is Billy – is cheated by a low-down, filthy snake named Scoots McGinty in a spitting contest, and he loses Steve to this cheat. Once Billy finds out that the contest wasn’t fair and square, he decides he’s gonna do whatever it takes to get Steve back. Along the way he meets up with a more-than-half-deaf old man, a slow minded kid named Sloop, the baddest outlaw in all the land, and the world’s fattest cow. Billy fights his way through all sorts of obstacles to win back his horse, surviving outlaws, angry mobs, and even some really antagonistic buffalo. You can get yourself a copy here or here. I started reading your book it is amazing nice job Mr.Curtis!!!!!!!! !